I’m at the Gartner Symposium conference in Orlando where it is raining as I write this. What is the Gartner Symposium? It is advertised as THE technology conference to attend for CIOs and senior IT executives and in this case, I have to agree with the hype, as an off-and-on attendee for the past 25 years, there is of lot of new information on technology trends. I do have to admit that this is my first time covering it on behalf of ITBusiness.ca as a blogger, in the past I have been here as a CIO. And besides yours truly, there are about 9,000 attendees and up to 13 concurrent sessions that are in five Disney hotels. The conference is, in one word, overwhelming. Coping with the logistics, the number of sessions, the different locations and the massive number of attendees are challenges that are here to test me. With all the sessions and material covered today, there was one major theme, that of digitization. First, I’ll provide some details on this and end by the worst thing today followed by the best that the Gartner organization did. Everything is digital. CIOs should aim for the CDO (Chief Digital Officer) job. As everything in the world is getting connected, it will affect all of us. “The digital industrial revolution is shaping up as one of those extraordinary jumps forward in the evolution of human freedom… and chaos,” said Daryl Plummer, vice-president at Gartner, in his top 10 Strategic Prediction talk. VP Daryl Plummer addresses a crowd during a key note sessions at the Gartner Symposium in Orlando. Digitalization is not an option or an add-on as every business is a digital business. Today less than 10 per cent of the organizations have a Chief Digital Officer, but this will increase three-fold over the next year. There is a perceived or real problem with IT leadership hence Chief Digital Officer (CDO) will be independent of IT; the 70 per cent of companies that have chief marketing technologists today, are independent of IT . If the CIO does nothing, she will become a custodian of IT infrastructure. How does the CIO survive in an increasingly digital world? The CIO should become the digital story teller in the business, like the CFO is for finance, spreading the financial story. Through this every executive will become a digital leader. This will take innovation, influence and courage on the part of the CIO. According to Gartner, CDOs won’t be around for long. By 2020 there won’t be a need for a CDO , as they are change agents, they would have completed their jobs, skills will be everyone’s skill set. One of the consequences of the digital industrial revolution will be people losing their jobs because of the technology interconnection and because of machines we programmed and “trained”. And these are not just jobs such as cashiers who lose their job because of self-checkout, meter readers because of smart meters but also Google and Apple are actively developing personal assistants. Once ready, Gartner predicts that virtual personal assistant applications will grow faster than iPad sales. IBM is also a significant player in the market. The Watson computer (of Jeopardy fame) derived smart advisors are a large and growing market for IBM. While Watson will contribute at least 1.5 per cent of IBM revenues by end of 2015; this will increase to 10 per cent by end of 2018. And then there is Apple’s Siri, constantly developing new features and understanding more commands. Can you imagine what a Siri front end and a Watson back end would do? Now for the what the organizers could do better is the keynote panel that started off the conference with the over 9000 attendees. The panel consisted of four men and no woman, not a good way of representing diversity at Gartner. 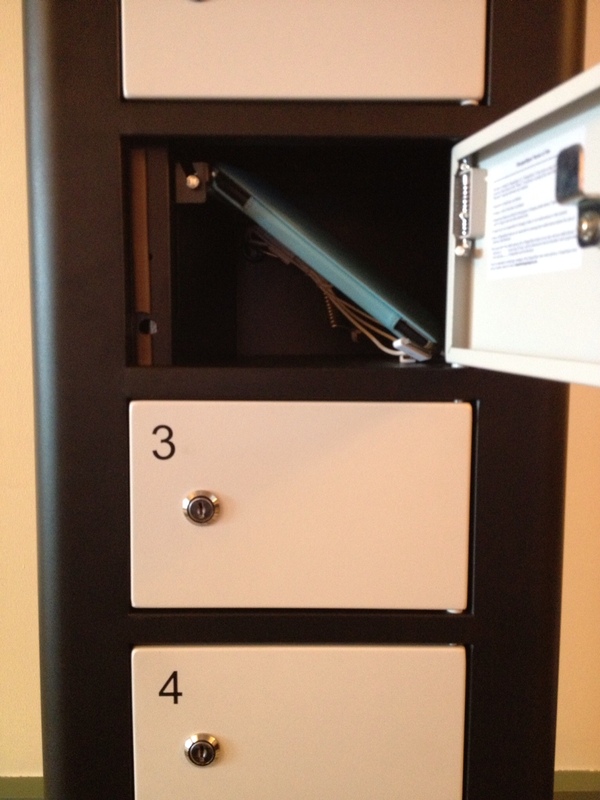 The best thing that the organizers did is to have small locker (about 5-by-5 inches) that had Apple and Android chargers and you could charge your smart phone or small tablet and lock the locker while it was charging so you did not have to stand around to wait for the device to be charged. There were open charging stations as well, but you had to hang around until the device charged. 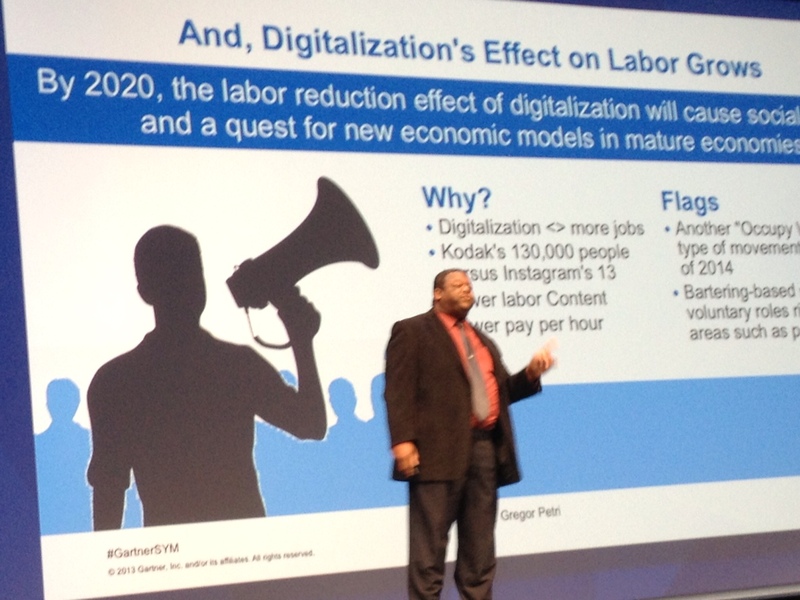 Do you agree with Gartner’s take on the effect of the digital industrial revolution? Do you have a CDO? Does the function report to IT or for example marketing? I’d appreciate your thoughts on the above topics – let me know in the comments here.